Director - Richard M. LoPachin, Ph.D. The Laboratory for Research in Neuropathogenesis and Remediation is a basic science resource for the Department of Anesthesiology at the Albert Einstein College of Medicine (AECOM). Research in this laboratory has been supported for over 30 years by the National Institutes of Health (NIEHS) and by industry and private funding. 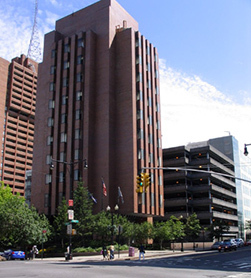 Located on the 7th floor of the Moses Research Tower at the Montefiore Medical Center (Rms 701, 708 and 710), the laboratory offers an outstanding research opportunity for residents and faculty with an interest in the Molecular Neurosciences. The laboratory is fully capable of providing the basic chemical and physiological techniques needed to conduct neuroscience research. In addition, state-of-the-art proteomic, electrophysiological, behavioral and imaging capabilities are available through the NIH Core Facilities on the AECOM campus; e.g., the Behavioral Core Facility and the Laboratory for Macromolecular Analysis & Proteomics. Interested faculty can consult with a senior research team regarding their scientific ideas and experimental design. If needed, investigators can receive subsequent “hands-on” guidance from laboratory staff. In addition to providing a basic science experience, a goal of the laboratory is to help early researchers publish their findings and acquire the skills needed to identify and develop fundable ideas. Research in the Neuropathogenesis laboratory is multifaceted (see references 1-3) and has, for example, included NIH-supported studies to define the influence of environmental pollutants (e.g., acrolein, methylvinyl ketone) on the acceleration of neurodegenerative conditions such as Parkinson’s and Alzheimer’s diseases. Most recently, our research has focused on the development of enolate-forming 1,3-dicarbonyl compounds that might be useful in treating pathogenic conditions that have a common molecular etiology of oxidative stress. LoPachin, R.M. (1999) Electron Probe X-ray Microanalysis: A Tool For Elucidating the Role of Ions in Neuronal Physiology and Pathophysiology. The Neuroscientist, 5: 371-382. LoPachin, R.M. and DeCaprio, A.P. (2004) ?-Diketone neuropathy: axon atrophy and the role of cytoskeletal protein adduction. Toxicol. Appl. Pharmacol. 199: 20-34. LoPachin, R.M., Gavin, T., DeCaprio, A.P. and Barber, D.S. (2012) Application of the Hard and Soft, Acids and Bases (HSAB) theory to toxicant-target interactions. Chem. Res. Toxicol. 25: 239-251. LoPachin, R.M., Gavin, T., Geohagen, B.C., Zhang, L., Casper, D., Lekhraj, and Barber, D.S. (2011) b-Dicarbonyl enolates: a new class of neuroprotectants. J. Neurochem. 116: 132-143. Zhang, L., Gavin, T., Geohagen, B.C., Liu, Q, Downey, K.J. and LoPachin, R.M. (2013) Protective properties of 2-acetylcyclopentanone in a mouse model of acetaminophen hepatotoxicity. J. Pharmacol. Exp. Ther. 346: 259-269. Zhang, L., Gavin, T., Geohagen, B.C., Korsharskyy, B., Vydyanathan, A. and LoPachin, R.M. (2014) Thiol and enolate-forming compounds as hepatoprotectants in a mouse model of acetaminophen hepatotoxicity. J. Pharmacol. Exp. Ther. submitted. Drug Development and Research Possibilities. Cellular oxidative stress is the underlying cause of many diseases (e.g., atherosclerosis, diabetes, Alzheimer’s disease) and tissue injuries (e.g., spinal cord trauma, cataracts). This pathogenic state involves the generation of free radicals and toxic unsaturated aldehydes that subsequently produce cell injury and death. We have discovered a series of 1,3-dicarbonyl enols; e.g., 2-acetylcyclopentanone (2-ACP; Fig. 1), that prevent injury in cell culture and animal models of oxidative stress (references 4,5). 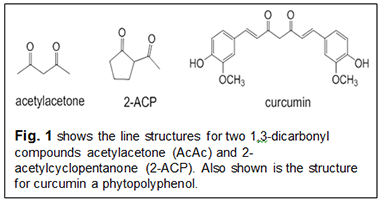 Whereas the use of enol compounds to prevent cell injury is completely unprecedented, it is based on the recognition that the well-documented protective properties of plant-derived polyphenols; e.g., curcumin (curry spice), phloretin (apple skins) and resveratrol (red wine), are mediated by similar 1,3-dicarbonyl enol substructures that mop-up (scavenge) toxic cellular chemicals which cause oxidative stress (Fig. 1). But, unlike curcumin and other plant-derived preparations, the 1,3-dicarbonyl analogs are chemically stable, non-toxic and rapidly distribute throughout the body. Our extensive chemical and molecular studies have delineated the mechanism by which the 1,3-dicarbonyl enols afford cell protection; i.e., scavenging toxic chemicals (unsaturated aldehydes) and metals (iron, copper) that participate in oxidative stress cell injury (reference 4). 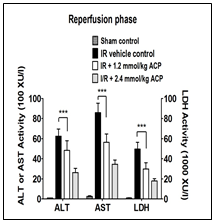 Laboratory animal studies have shown that 2-ACP can provide nearly complete protection in experimental models of liver injury associated with Tylenol poisoning and ischemia/reperfusion (reference 5). Therefore, based on this research we think that 2-ACP or an analogue might be useful in treating the following conditions. Augmentation/hepatoprotection during Tylenol administration: Intravenous (i.v.) infusion of Tylenol can provide substantial analgesia and is increasingly preferred over the use of narcotic drugs that have significant side-effects such as constipation and dependence. However, the amount and duration of Tylenol infusion is limited by the risk of hepatotoxicity, especially in liver-compromised patients; e.g., alcoholism, chronic hepatitis, cirrhosis. We have shown that 2-ACP can completely prevent severe liver damage associated with acute oral Tylenol poisoning (reference 5). Therefore, addition of 2-ACP to the i.v. Tylenol formulation could significantly reduce the risk of hepatotoxicity. This would allow an increase in the amount and duration of Tylenol infusion, which would substantially improve the clinical management of pain. Prevention of drug bioactivation: Tylenol-induced liver damage is mediated by an extremely toxic metabolite, abbreviated as NAPQI. 2-ACP can bind this metabolite and thereby prevent Tylenol hepatotoxicity (reference 5,6). Similarly, biotransformation to a toxic metabolite can limit the clinical utility of many other drugs; e.g., diclofenac, cyclophosphamide, valproic acid. However, like NAPQI, 2-ACP also can bind the metabolites of these pharmaceutical compounds thereby preventing the development of secondary toxicity. Therefore, 2-ACP added to the regimen of clinically-important drugs that undergo bioactivation would improve patient safety, compliance and, ultimately, therapeutic outcome. Prevention of cisplatin neurotoxicity: Cisplatin and other platinum-containing drugs are first-line treatments for cancers of the head, neck and testicles. Nonetheless, the clinical utility of these drugs is limited by the frequent appearance of a very painful sensory neuropathy caused by direct cisplatin damage of peripheral neurons. 2-ACP can bind to cisplatin (chelate) and therefore, in conjunction with an ability to prevent oxidative stress, this 1,3-dicarbonyl could prevent the debilitating peripheral neuropathy. Development of 2-ACP as a neuroprotective strategy, would have a significant impact on the clinical management of cisplatin side-effects and thereby broaden the utility of this highly effective chemotherapeutic approach. Prevention of ischemia/reperfusion (I/R) injury: I/R injury is the basic pathogenic process that mediates brain stroke and organ failure following resection and transplantation. Oxidative stress is a significant component of tissue injury associated with I/R and, accordingly, ongoing studies have shown that 2-ACP can prevent damage in a rodent model of liver I/R (Fig. 2). These experiments suggest that the 1,3-dicarbonyl enols might be useful in preventing or lessening tissue injury and improve clinical outcome following stroke or heart attack. Organ preservation: As indicated above, I/R-induced tissue compromise is a significant component of organ failure during transport and transplantation. Therefore, addition of 2-ACP to the organ preservation solution (e.g., Wisconsin’s solution) could reduce the incidence of organ failure during transplantation. The Clinical Research Anesthesiology (CRA) unit is dedicated to generating superior research with the support of faculty, residents, students and other collaborators. The CRA unit’s mission is to provide support to faculty, residents, students and pharmaceutical sponsors for conducting research within the field of anesthesiology and subspecialties. The CRA unit provides assistance in designing studies, protocol development contract executions, budget development, data collection and statistical analysis. Additionally, the CRA unit works as a liaison between sub specialties within the department and other research organizations within the institution. The CRA unit’s staff is experienced in preparing IRB applications, preparing informed consents, submitting amendments and fulfilling other various IRB and research requirements. The CRA unit coordinates and guides researchers on how to obtain assistance from the Montefiore Institute for Clinical and Translational Research (ICTR) facilities such as the Montefiore Office of Clinical Trials (OCT), the Clinical Research Center (CRC), and the Biostatistics and Study Design Department. The OCT assists investigators in budget negotiations, contract executions, invoicing for services, subject recruitment, and retention planning. The CRC provides a space for expert staff to conduct outpatient research studies. The core laboratory facility associated with the CRC assists in collecting, processing, and shipping biological specimens. The Biostatistics and Study Design Department offers expertise in designing complex study protocols and providing analytical solutions for preparing manuscripts. The CRA unit is involved in conducting national and international multi-center industry sponsored and investigator initiated clinical trials in the department. Clinical trials are conducted in all sub specialties of anesthesiology. Dr. Ellise Delphin MD, MPH is one of the co-investigators of an industry sponsored multicenter matched-pair cluster-randomized controlled trial study evaluating transfusion practices of anesthesiologists associated with the use of continued hemoglobin monitors in patients undergoing elective surgeries. She is also the co-investigator of another multicenter study, “Protective Ventilation with Higher versus Lower PEEP during General Anesthesia for Surgery in OBESE Patients – The PROBESE Randomized Controlled Trial”. This study is comparing a ventilation strategy using higher levels of positive end–expiratory pressure (PEEP) with recruitment maneuvers versus one using lower levels of PEEP without recruitment maneuvers in obese patients at an intermediate–to–high risk for postoperative pulmonary complication (PPC). Dr. Jonathan Leff MD is participating in a Canadian Institute of Health Research (CIHR) funded multicenter study evaluating restrictive versus liberal transfusion strategies in patients undergoing cardiac surgeries. He is also the principal investigator of an investigator initiated study evaluating the use of near infrared spectroscopy (NIRS) technology in preventing post cannulation complications in patients undergoing extracorporeal membrane oxygenation (ECMO) treatment. Dr. Galina Leyvi MD is the principal investigator of an investigator initiated study collecting intra operative and post-operative blood specimens for the comparison of inflammatory responses in robotic, hybrid, and conventional coronary artery bypass surgeries. Dr. Christopher Tanaka MD is studying the utilization of transesophageal echocardiography (TEE) as an alternative to direct cardiac catheterization to measure pulmonary artery pressures. He is also studying the use of transthoracic echocardiography in studying the association between pre-operative hypovolemia and post induction hypotension. Dr. Naum Shaparin MD is collaborating with a nationally recognized laboratory studying the use of saliva for drug testing. ?Biological specimens are collected from patients on chronic opioids and are compared for their level of opioids. Dr. Boleslav Kosharskyy MD was one of the co-investigators of a recently concluded industry sponsored multicenter randomized controlled study assessing the impact of transversus abdominis plane (TAP) infusion of long acting bupivacaine in patients undergoing lower abdominal surgeries. He is also studying the safety and efficacy of the placement of two adductor canal blocks in knee replacement patients. Dr. Amaresh Vydyanathan MD is the principal investigator of an investigator initiated industry sponsored randomized controlled study evaluating the use of a needle guidance device when performing regional anesthesia. He is also the co-investigator of an investigator initiated industry sponsored randomized controlled study evaluating the effectiveness of the use intranasal ketorolac in urological patients. Medical students have the opportunity to be paired with faculty during the summer months for ongoing clinical research. The summer program gives medical students an opportunity to have their name on a publication/poster, possibly attend a meeting, and also a great CV opportunity. The Medical Student Anesthesia Research Fellowship Summer Program provides students with a challenging and rewarding experience that exposes them to the opportunities within the medical field of anesthesiology and research. Eight weeks of focused research related to anesthesiology. A dedicated mentor who will provide guidance and training in research techniques and scientific methods. The opportunity to make a scientific poster presentation at the American Society of Anesthesiologists annual meeting, during the FAER MSARF Symposium. A $400 per week student stipend, ASA student membership dues, plus additional funds to help cover the costs of travel to the ASA meeting. E601 Research in Regional Anesthesia & Pain Medicine (Montefiore Medical Center-Wakefield Division). Projects in both basic science and clinical research are available for the motivated medical student interested in a career in Regional Anesthesia and Pain Medicine. Areas of research include (but are not limited to): usage of peripheral nerve blockade/catheters and epidural catheters in acute and chronic pain, opioid and non-opioid therapies for acute and chronic pain syndromes, neuraxial acute and chronic pain, joint acute and chronic pain, peripheral nerve pain, vulvodynia/perineal pain, and coccygodynia; radiofrequency ablation; and neuromodulation. Interested students should make arrangements to meet with Dr. Shaparin and Dr. Vydyanathan to identify a research project. Implemented the plan, which may or may not be completed by the conclusion of the elective. Projects that run beyond the elective may be continued with knowledge of the faculty mentor. Learning experience: Students who have completed this elective will have an understanding of how to conduct a research project in regional anesthesia and pain medicine through application. Interested students are expected to work towards submission of abstracts and manuscripts for publication under the direction of faculty mentor. The typical workday will be Monday to Friday from 8 am until 4pm, however hours will vary based on the specific project the student is working on. Method of student feedback and evaluation: Students will be evaluated on their level of participation in conducting the research project and meeting the stated objectives. Emphasis will be placed upon the student’s ability to be instrumental in advancing an ongoing research project or developing an original research idea. Since 2011, Montefiore/Einstein Anesthesiology Department sponsored at least one junior faculty in the mentored research training, funded through the National Center for Advancing Translational Sciences (NCATS), a component of the National Institutes of Health (NIH). Through these and other funding mechanisms, Anesthesiology faculty are enrolled in and have graduated from Master of Science programs in Public Health and Business Administration at Columbia University, Georgia Tech and the Albert Einstein College of Medicine. We are actively seeking qualified faculty and fellows to continue this initiative. Dr. Michael Andreae is applying novel methods of evidence synthesis and statistical modeling to long-term pain and cognitive outcome in collaboration with Professor Hall in the department of statistics and epidemiology. Funded through the National Center for Advancing Translational Sciences (NCATS), a component of the National Institutes of Health (NIH), he applies Bayesian and non-linear change point models to outcomes research in regional anesthesia, pain and postoperative cognitive decline. Specifically, he performed systematic reviews and meta-analysis on regional anesthesia for the prevention of chronic pain after surgery (Andreae 2013), regional anesthesia for improved long term function after major joint replacement (Atchabahian 2012) and, in collaboration with the Icahn School of Medicine at Mount Sinai, on cannabis for chronic painful neuropathy in people living with HIV (Andreae 2014 submitted) and micronutrients for HIV (Carter 2014 submitted). He recently began to work on cognitive outcome after surgery and the effect of pain on cognition in collaboration with Professor Lipton, department of neurology and the Einstein Aging Study. An Einstein medical student is conducting her senior year research fellowship in our group. Andreae MH, Andreae DA. Regional Anaesthesia to Prevent Chronic Pain after Surgery: a Cochrane systematic review and meta-analysis. Br J Anaesth. 2013 Nov;111(5):711-20. doi: 10.1093/bja/aet213. Epub 2013 Jun 28. Review. PubMed PMID: 23811426; PubMed Central PMCID: PMC3793661. Atchabahian A, Schwartz G, Hall CB, Lajam CM, Andreae MH. Regional analgesia for improvement of long-term functional outcome after elective large joint replacement (Protocol). Cochrane Database of Systematic Reviews 2012, Issue 12. Art. No. : CD010278. DOI: 10.1002/14651858.CD010278. In collaboration with Professor Henry Sacks and Rosamund Rhodes at the Icahn School of Medicine at Mount Sinai, funded through a Conduit CTSA/NIH grant, Dr. Andreae is investigating ethical, social and legal barrier to research on therapeutic uses of controlled substances for people living with HIV. He uses focus group discussions and other mixed social science research methods to elicit, analyze and contrast the perspectives of the various research stakeholders, including research subjects living with HIV. Drs. Naum Shaparin, Michael Andreae and A. Kaufman investigate barriers to access care in underserved populations (Shaparin et al 2014). This lead to an ongoing analysis to test if simple targeted interventions can improve attendance in our population and to a randomized controlled trial to improve access for non-English speaking patients at our chronic pain clinic. The medical student involved has since graduated from Einstein and matched in anesthesia at an ivy league program in New York, but continues to collaborate with our team. Shaparin N, White R, Andreae M, Hall C, Kaufman A. A longitudinal linear model of patient characteristics to predict failure to attend an inner-city chronic pain clinic. J Pain. 2014 Jul;15(7):704-11. doi: 10.1016/j.jpain.2014.03.004. Epub 2014 Apr 18. PubMed PMID: 24747766; PubMed Central PMCID: PMC4086826. The Cardiothoracic Anesthesiology Fellowship Program is offering a structured course in Clinical Research. The course consists of a series of lectures on study design and statistical analysis. Fellows are encouraged to use data from their previous studies and current departmental research. They are being coached to begin with formulating a research question and collecting data, to the use of appropriate statistical analysis, drawing conclusions, and publication. The course is led by faculty who have graduated from the Master of Science program, Albert Einstein College of Medicine, Einstein Clinical Research Training Program funded through the National Center for Advancing Translational Sciences (NCATS), a component of the National Institutes of Health (NIH). Dr. Chao is currently enrolled in the Einstein Clinical Research Training Program where he is designing prospective studies on the following topics. The effects of anesthesia on the developing human brain. Parental perceptions of commonly employed anesthetic techniques, particularly regional anesthesia, for intraoperative and postoperative analgesia. Dr. Chao is currently investigating various demographic characteristics of patients and their families and the effects on willingness to accept caudal block by using a preoperative survey instrument. Dr. Chao is the institutional liaison for Wake Up Safe, a national pediatric anesthesia quality improvement organization sponsored by the Society for Pediatric Anesthesia. Institutional quality data are shared with the larger organization with comparisons of institutional and national data with the intention of examining our practice and continuous improvement.